When I used to pour concrete, I would get home each night and hose my truck down. Once a week I would grab a bucket of soapy water and a broom – then sweep my way to a clean truck. One of the guys I worked with caught wind of what I was doing and came at me one day during lunch, “What the f*ck are you thinkin’? Get a pressure washer!” His insistence was understood and the next day he brought his to work for me to wash down my truck with it. After 20 seconds I told him to turn it off, and drove myself home, went on Amazon and bought my first pressure washer. No idea why I waited so long. It arrived 2 days later, you just plug it in, connect your garden hose to it and pull the trigger to start cleaning. It’ll cut hours out of your weekly work, I promise. There’s no better way to clean your vehicles, lawn equipment and patio furniture than with a small and portable pressure washer. They cost $80 to $130 and are light, quiet and easy to get started using. Obviously when you’re buying an entry level machine, you face the same downsides. If you’re running a pressure washing business, or have a lot of concrete that you’re going to be washing every year, you might want to look at a medium duty pressure washer. For all the good things I have to say about these smaller portable pressure washers, they come with down sides. For example, their parts are not commercial quality. For things like pressure washing your car once a year, they work fine, but under commercial/repeated stress, you’re going to grind one of these entry level power washers to a halt. If you’re into bigger jobs, or are running a pressure washing business, you’ll end up saving money by investing in a unit designed to take a daily beating. What are the best entry level pressure washers? 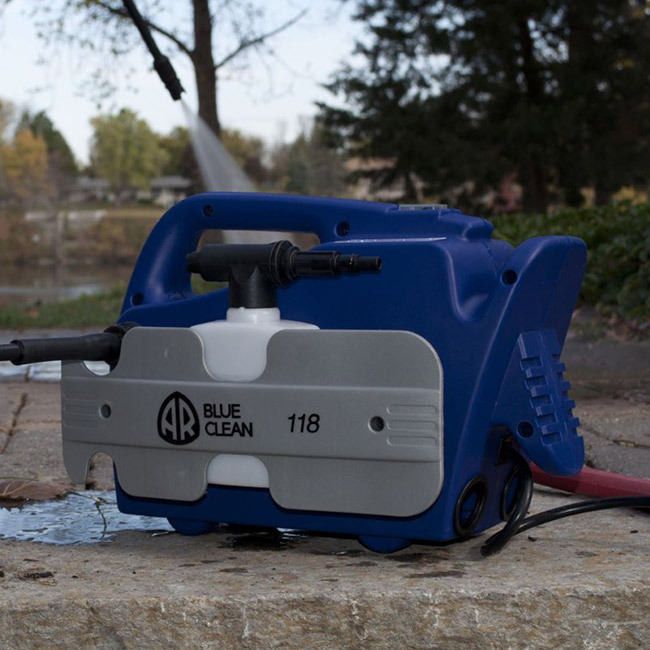 AR’s Blue Clean is an amazing little machine – and I mean little. This pressure washer is small enough to be carried around and is a great entry level power washer. If you’re looking to clean your bicycle, or small front-entry to your house, this is a great machine. The Blue Clean‘s strength is in it’s portability, and the ability to carry this from place to place, but that’s also it’s drawback. After a few jobs, you’ll dream of having something that you can wheel around. If you’re getting older, you might consider the Sun Joe SPX1000 listed below as it has wheels. AR provides more information on their website. 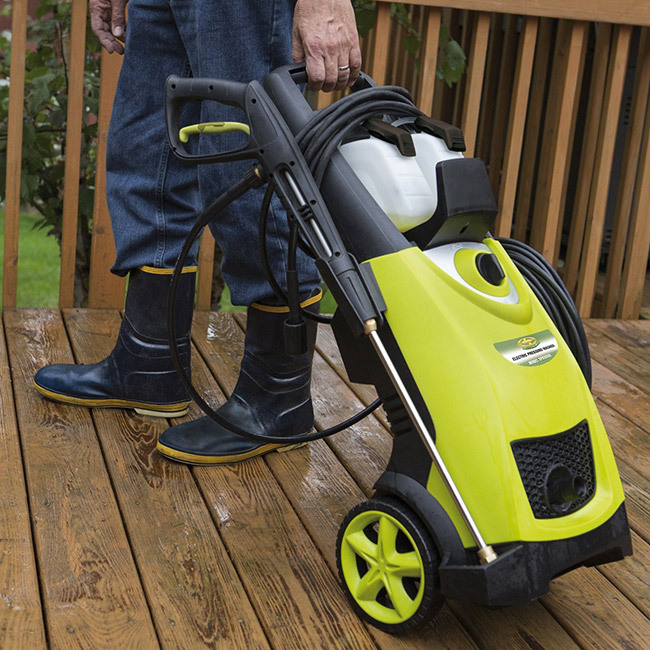 A portable pressure washer, great for small cars, patios, bikes, and barbecues. Get the best price on Amazon. The holy grail of light duty pressure washers. All the benefits of other entry level machines, but with the added bonus of wheels. Get the best price from Amazon. Pressure washers are fairly heavy for their size, and it doesn’t take long after you start your pressure washing job to appreciate Sun Joe’s decision to put wheels on their SPX1000. The wheels alone make this entry level power washer worth the extra cash you invest. The Sun Joe is a bright yellow pressure cleaner and looks great. In addition to wheels, you’re also getting a slightly better build. If you want to roll your pressure cleaner around instead of picking it up then the Sun Joe SPX1000 is your best option.